The soccer (football) formation is an arrangement of the players on the pitch and their behavior during the game to meet the objectives set by the soccer coach. 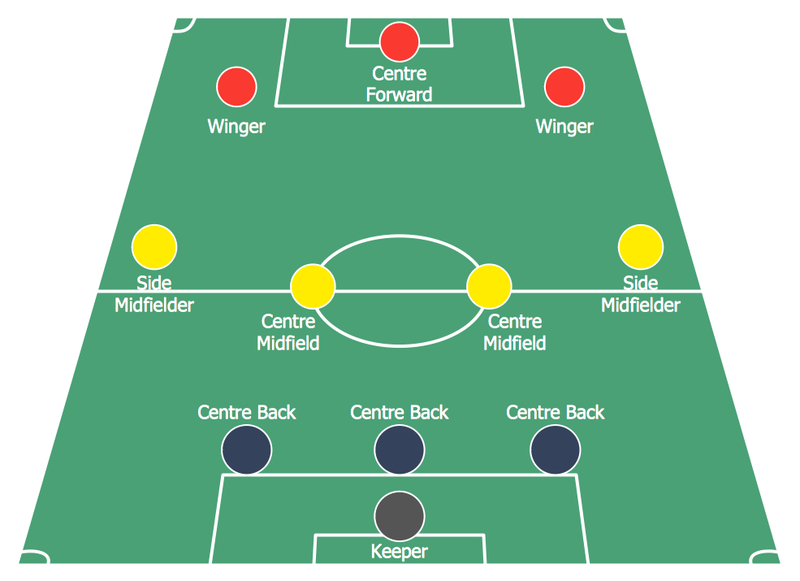 The different formations are used depending on the team goals. Thanks to a certain starting position of the player it is possible to define its main tasks in the match. The numbers in the designation of the formation mean respectively: the number of defenders, midfielders and forwards. Using diagrams is the easiest way to explain the soccer formations. The Soccer solution from the Sport area of ConceptDraw Solution Park is designed as a tool that helps you produce the soccer diagrams in a few minutes. The predesigned samples of the Soccer solution for ConceptDraw DIAGRAM depict the most popular formation diagrams. This sample shows the 2–3–5 formation that is also known as the "Pyramid". By the 1890s, it was the standard formation in England and then it was spread all over the world. In this formation was reached the balance between the attack and defense. On this sample you can see the soccer formation 3–2–5 WM. The WM system was created in 1920s by Herbert Chapman of Arsenal. Was reduced the number of opposition players and was introduced a centre-back to stop the opposing centre-forward. The WM system was subsequently adapted by several English sides. 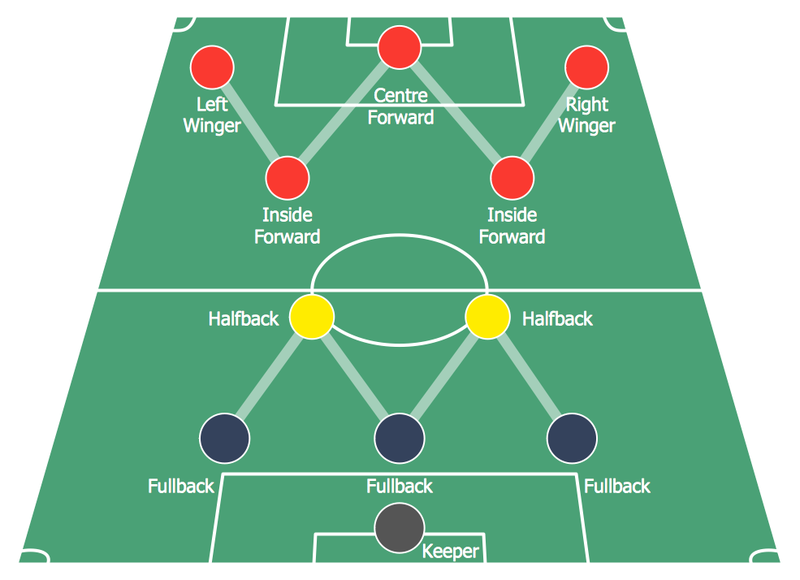 This sample shows the formation 3–4–3 that is used by the offensive teams, for example by Liverpool under Rafael Benitez during the second half of the 2005 UEFA Champions League Final. There are only three defenders. So if the opposing team will break through the midfield, they will have a great chance to score. 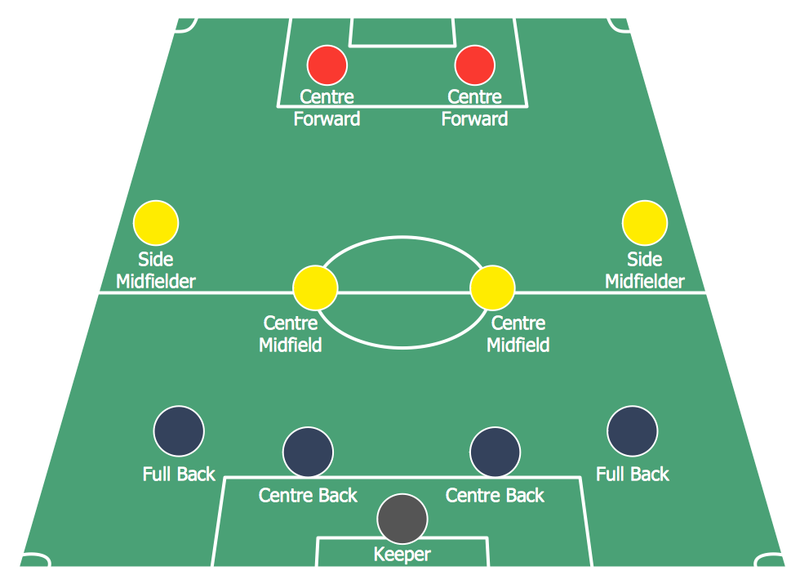 The soccer formation 4–3–3 that you see on this sample was developed from the 4–2–4. The Brazilian national team in the 1962 World Cup was played 4–3–3. The three midfielders move laterally across the field as a coordinated unit and play together to protect the defense. The three forwards split across the field to spread the attack. The 4-3-3 formation is very useful for ball retention and for a short passing game. This sample demonstrates the formation 4-4-1-1. One of the strikers plays as a "second striker" ("in the hole"). The second striker is a playmaker that can easy drop into midfield to pick up the ball before running it. On this sample you can see the soccer formation 4–4–2 that was successfully used by Fabio Capello that won three European Cups, two Intercontinental Cups, and three UEFA Super Cups between 1988 and 1995. And also Carlo Ancelotti's Milan used it on the UEFA Champions League where he won the final in 2003 and made runners-up in 2005. 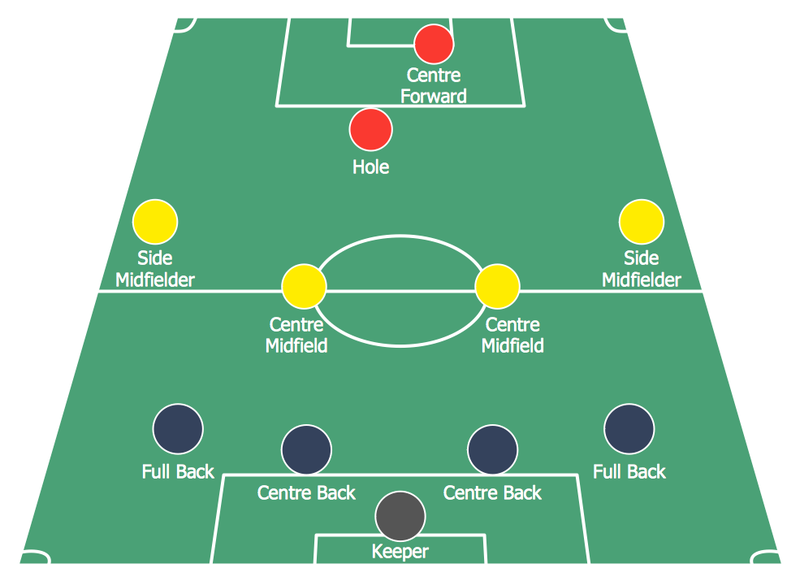 The formation 4–4–2 has only two forwards and is defensive formation. The team forms the game on the counter-attacks. The samples you see on this page were created in ConceptDraw DIAGRAM using the Soccer Solution. They demonstrate the solution's capabilities and the professional results you can achieve. An experienced user spent no more than 5 minutes creating every of these samples. Using diagrams is the easiest way to explain American Football defensive formations. The Football solution for ConceptDraw DIAGRAM v12 contains a set of samples depicts the most popular defensive formations diagrams. Using embedded presentation tools you are able to share your football knowledge with wide audience. Producing football diagrams using ConceptDraw DIAGRAM v12 software takes seconds, not minutes. Thanks to Baseball solution from the Sport area of ConceptDraw Solution Park all you need is just drag and drop ready-to-use positions objects to a template contains baseball field, and place positions on the field.